My latest trip to Syria was spent in Aleppo and Damascus. During my time in East Aleppo I was struck by the hive of activity, pockets of industry, rebuilding the stricken neighborhoods, stone by stone. Despite lack of electricity and water, in each street and alleyway, the sound of welders and the beat of hammers, rang out. The sparks from a trio of welders spilled onto the pavement where we sat and drank coffee with residents, returning to their communities that had been so fractured by the almost 5 year occupation of these districts of East Aleppo, by Nusra Front-led extremist brigades. In Jaramanah, Damascus we met with many internally displaced people. 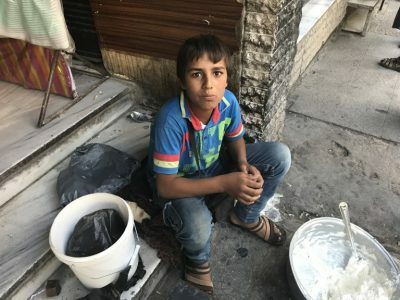 The estimated 6.4 million IDPs in Syria have almost invariably, fled to Syrian government controlled areas for refuge from the US Coalition extremist factions who have driven them from their hometowns and villages across Syria. This area had historically been Druze and Christian populated. Now it has been crowded with Syrians from all walks of life, backgrounds and regions. All spoke to me of their hardship under the US Coalition armed & funded extremist & terrorist factions. Many had been driven from their homes by the armed mercenary forces, suffering hideous wounds in the process. One old man from Talbiseh in Homs had lost one leg, been shot in the spine and had his remaining foot crushed by the Nusra Front brigades who had invaded his village and driven inhabitants from their homes by force. He was selling bread on the street, provided by his wife, to pay for an apartment with no roof. He “spat” on the “freedom and democracy” that his attackers have brought to his life, according to the western corporate media. “We had “freedom” before the crisis. These so called “freedom fighters” brought nothing but suffering, they drove us from our homes. They brought nothing but weariness, loneliness, death and poverty”. The daughter of one of these women also spoke to us. Shyly she explained that she missed her home, she missed her school and she wanted, more than anything, to go back, “when it was safe“. During my time in Aleppo, we visited the Sid Al’Ose street and square in the Alsh’ar district. In this area, Nusra Front and associated extremist brigades such as the Turkish funded, Abu Amara, had executed civilians accused of being “shabiha” – loyal to the Syrian government or simply refusing to adhere to the extremist ideology of the occupying forces. Forces backed, promoted and armed by the western and Gulf state nations working to destabilize Syria and enforce “regime change”. Life had returned to quasi-normalcy in this vibrant street. We spoke to shopkeepers and residents, all of whom shied away from talking about the horrors they had witnessed, preferring to erase such memories from their psyche. One shopkeeper, however, did tell us that the area next to his shop was where the terrorists had brought the bodies of 7 civilians who had been murdered at the Bayan hospital (see above photo), close by. They had been shot multiple times and one had been flung from the multi-storey roof of the Bayan hospital. Their bodies had then been dumped outside the lock-up, in the street, as a warning to residents to stay where they were and not to attempt to escape East Aleppo for the safety of West Aleppo. The following report from Russia Today further demonstrates the reality (admitted by the UN) that over 600,000 external refugees have returned to Syria, since the SAA and allies have advanced militarily and cleansed entire swathes of Syrian territory of the US Coalition-armed and funded, terrorist-led insurgents. “Aleppo, a city retaken by Damascus from rebels in December last year, has become a major destination for displaced Syrian returning home in 2017 as numbers of returnees to Syria spills over 600,000, according to the UN. An estimated 67 percent of returnees went to government-controlled Aleppo Governorate, with the provincial capital itself being the primary destination. Despite its deep wounds and scars, Syria will rebuild and it will emerge, renewed, stronger, and more resilient than ever before. From out of the fire of neocolonialism, will be born a new more powerful Syria, wiser and reinforced by new alliances, the much strengthened historical alliances and expanded geopolitical savvy.